In my Demon Guardian Series, one of the teens has out of body experiences, which causes her to appear to be daydreaming in school. In Deidre’s Secret, the teen story, and her story as a grownup in Bound by Danger, Deidre has premonitions of things that will occur, and so again, people oftentimes believe she is daydreaming. Don’t both of those situations sound a lot cooler than: I zoned out and was daydreaming? Only it’s no fun, because they can’t tell anybody that, who would ultimately believe them. So the thing of it is–I’m not really daydreaming. I’m plotting my next great novel. Sounds good, doesn’t it? You see, there’s nothing more boring than telling the truth, sometimes. So make up a good story! In the moon shot I shared yesterday, the moon wasn’t really great, but I wanted to show off the North Star above it. 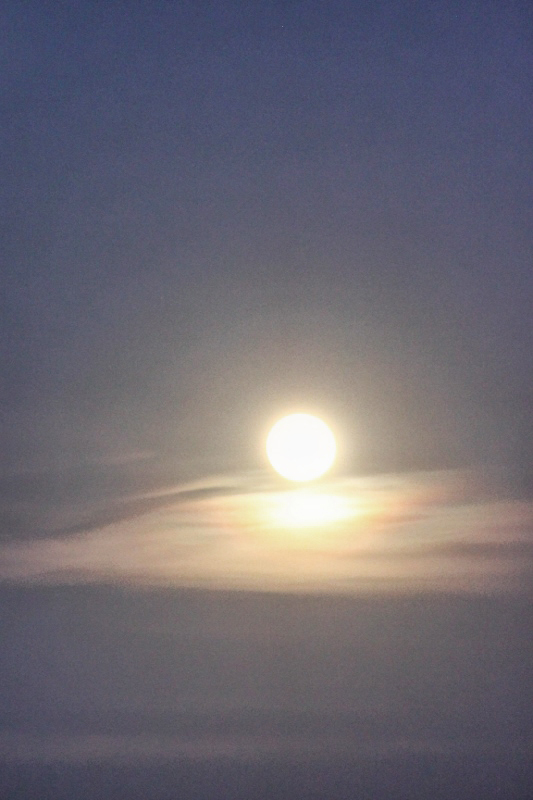 With this one, I thought it was cool that the moon was reflected off the clouds as if it was reflecting off water. And no more daydreaming or out-of-body experiences or psychic phenomenon for me. Strictly time for writing. I daydream all the time. My mind is always wandering. What ate you doing up so early? I’m finally breaking my insomnia. Night Terry! That is a great pic. I daydream when I first wake up in the morning when I am drinking my coffee. I have been meaning to tell you that when you sent those fog pictures and I said we don’t get fog that often we had a lot of fog ever since, including last night. Heavy fog. I kind of laughed. It is the weirdest thing to happen just as I said that. Oh well maybe Terri had one of her Mage send some my way. Have a great day!!!! LOL I meant to say Fae… When I was a young girl I use to like to sit in the house and write small stories but my dad got mad and said to go outside and play. We lived alone together. I think thats why I always liked reading. I wish he would have let me follow what I wanted to do but he for some reason didn’t think what I was writing was appropriate. I don’t remember what it was but since I was only like 11 yrs old or so and didn’t have a clue about anything it couldn’t have been much. It was the late 1950’s so who knows what older people thought then. I remember having little stories around the house tied together with strings till he threw them out. 50 some yrs ago…hmm long time. I always wished that I could have grown up in these times when it is more progressive. No matter what I could never keep up with you. Loved Silence of the Wolf!!! Keep em coming!!!! I daydream to help me get to sleep at night. sometimes it works, sometimes not but it’s worth trying!